More woodies are never a bad thing, right? 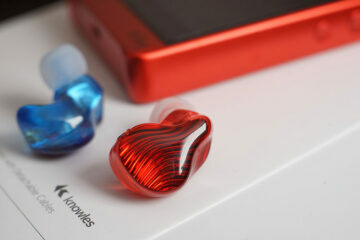 It seems Thinksound has improved upon their last generation iems a bit, updating and paving a path for the new kids on the block. There has been a serious boom in the low-fi to mid-fi market of the audio playland recently, so many great products and great values to pick from. 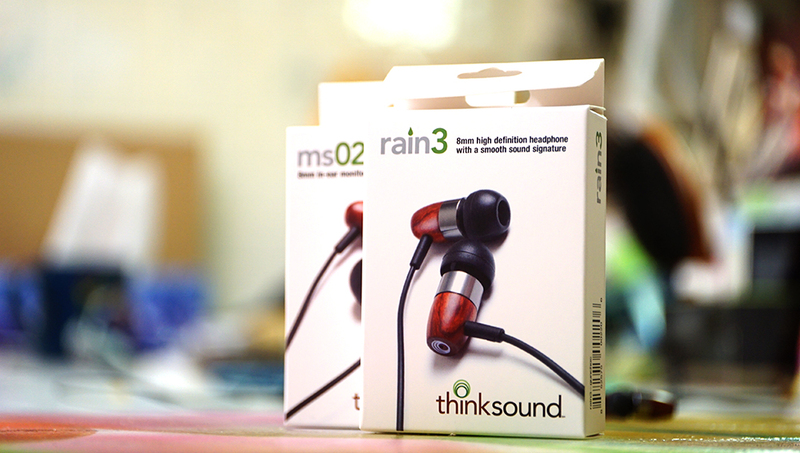 Today, we are going to dive into two of Thinksound’s newest and really put them through the gauntlet: the MS02 and the Rain3. Trial by Fire and Ice. Both models come in an adorably small box, complete with extra tips. Both the Rain3 and the MS02 share the same design and both are totally lacking any identifying marks and model name’s on the actual product. I am not so sure this was a good idea. I’ve had to wrap a twisty tie around the MS02 just to make sure I knew which one was which during the testing phases of this review. Let’s make sure this isn’t a thing in the near future and to always make sure the product name is on said product somewhere. For now, the only way to actually tell which is which, is by looking at the rear of the iem housing itself, as the MS02 has no vented ports, but the Rain3 does indeed have a small vented port in the rear area of the housing. 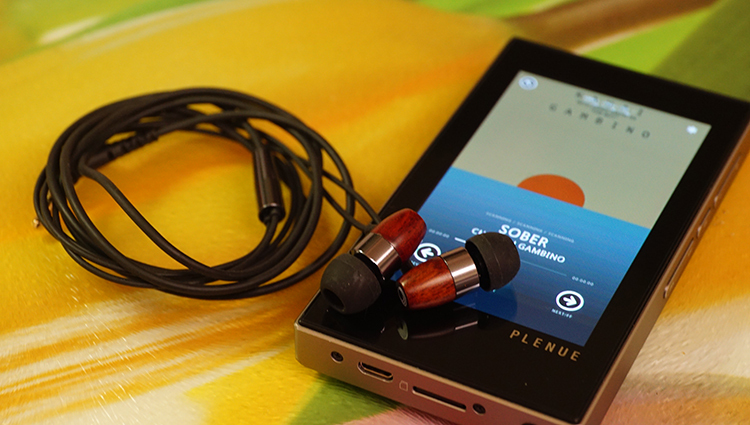 Both models are crafted out of wood, but the MS02 offers passive Noice Cancelation, the Rain3 does not. Both share the same cable with an angled L-style adapter, not fully 90 degrees but somewhere in the middle of straight and right angled. 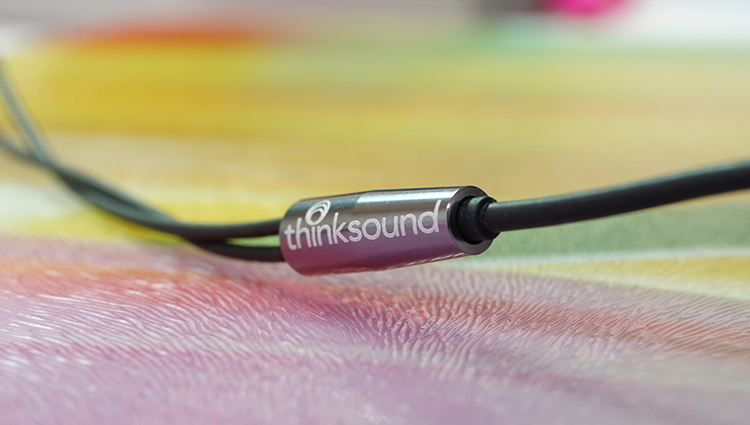 As for the cable itself, for a $89-99 iem, it is of an average quality and doesn’t stand out at all. The front grills are metal mesh and seem of a nice quality. The metal nozzles are similar to my TFZ S5 nozzle quality, which is a great thing, at least in my opinion. The MS02 feels the warmer of the two, but I wouldn’t consider it overly warm. I feel a cold chill when I swap from this model to my TFZ S5, longing for the Thinksounds very musical and fun sound signature from top to bottom. Oddly, the Rain3 seems more natural, less colored overall in the bass and midrange, but with a cooler top end. This is a very odd setup to my ear. I’d classify the MS02 as the musical and fun brother, the Rain3 as the more relaxed of the siblings. Due to the sealed and Passive NC design of this model, bass output is higher in terms of physical impact. This is typically the case in fully sealed iems, opposed to those with a vented port. The dynamic impact is moderate, certainly not wince-worthy nor overly soft. There is an excellent and engaging factor with regard to slam and kick but I’ve noticed that the overall quality of the experience is just a bit more bloated to my ear than found on the Rain3 model. Here and on the MS02, the experience down yonder in the low-frequency output areas is thicker, heftier and as a result of that are also more prone to some distortion. Yes, sadly, I feel slightly bloated is the proper term to use. But fret not, it is not severe nor bothersome. If you like bass quantity, this is the better model for you to pick up out of the two. I’d not call it ugly, I just feel it objectively inferior in quality to something like my TFZ S5 ($79) and my Flare Audio R2A ($99 when on sale) by a noticeable margin. Noticeably smoother, purer and with a lesser quantity than the MS02. Undoubtedly, this model is offering the higher quality, smoother experience of the two. Hell, even the box said it was very smooth and rightly so. This is a buttery low end, for sure, but also lacking the nice depth and literal quantity response of the MS02. Surely, both models were made to satisfy both types of listeners out there. 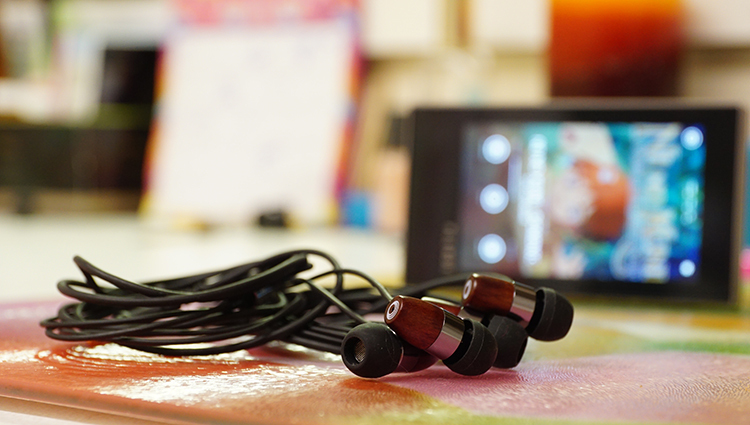 Where the Rain3 is the more neutral on the low end of the two, less colored, less bloomed and more smooth and clean, the MS02 is the one seemingly intended for those who want to rock out and experience more exaggerated low-end experiences. Both are nice, but there is no questioning the Rain3 is the superior brother in terms of bass quality. Both seem to hit equally and moderately so, neither too harsh nor too soft. Both seem of an equal physical dynamic impact level that I consider right in the middle, well suited for a title of “properly engaging without being annoying or boring”. Interestingly enough, the midrange of the MS02 is a bit more forward and symmetrically in line with the treble experience as well. Meaning, moderately forward mid and vocal experiences and smooth treble. Quality is very nice for a sub $100 iem in the 2016-early 2017 market, as I’ve only encountered a few iems out there that seem superior. Substance factor is also middle-ground, as I’ve heard much thicker and much thinner sound signatures in this price tier from competitors. What I am enjoying a lot is the lack of a nasalness near the upper midrange areas and closer to the treble. Thankfully, there isn’t any hiss or problematic sibilance that I can detect. Recessed?! There is an immediate difference in the relaxed nature of the midrange on this Rain3, in comparison to the MS02. No doubt, there is a slight U-shape curve occurring here as the vocal experience is gently pushed back just a smidgen. 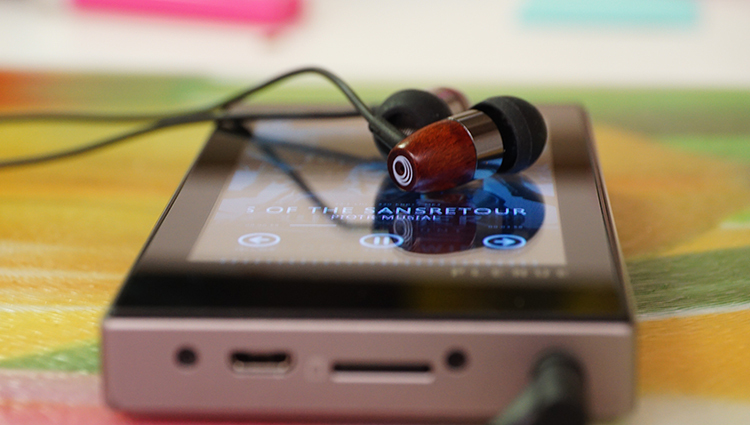 Oddly, the entire midrange also feels noticeably more smooth and thin, more neutral in tone vs the MS02. I suspect that is because the MS02 offers a heftier tonality in it’s low end and that the aim of that model was to have more heft to the entire spectrum. This Rain3, when bass EQ is utilized and dropped off in non-bassy tracks, showcases less substance than the MS02. This is especially noticeable with the central areas of the frequency response curve. Quality aside, those who enjoy a relaxed presentation and more smoothness will prefer this model over the MS02. As mentioned, there isn’t much nasalness or problematic tendencies in this model, it seems the mids and treble are pretty much in line and close to linear feeling for the most part. What that means is that the treble is not overly pronounced, nor overly muted in comparison to the midrange. Despite that, I still consider it reserved and played safe in terms of quantity. Swapping from this to my R2A and TFZ S5, I am instantly met with more clarity and more quantity in the Flare model and for roughly the same price at around $100 or so if there is a sale. Dynamics and physical impact are also a non-issue, thankfully. 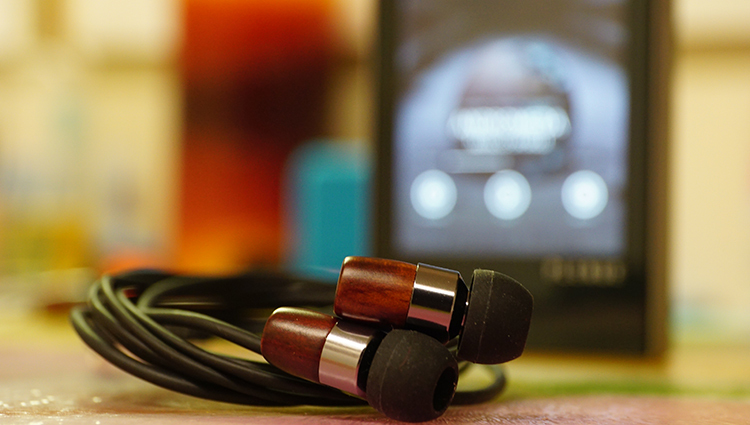 The set seems setup to enjoy for hours without feeling fatigue, lacking that physical slam up top is a very nice thing to have for casual listening experiences on the go. Oh boy, well…I hear some sibilance here. Just a little. There is more quantity in the Rain3 than the MS02 brother model. Not by too much, but it is certainly presented with more abundance. Booting up a track titled Pop Thieves by Childish Gambino, I hear typical, but very slight hisses with each “s” that occurs. This very well could be due to the vented ports. No real evidence, just my speculations. I pushed this model to the same EQ’ed treble levels, upward of +5dB each and came away with a result of the MS02 being the less inclined to alter at all with that amount of push up top. The Rain3, however, became audibly more pronounced up top with that extra +5dB. Weird. Is it possible this model is pulling too much air or is somehow not well suited for usage with a vented port? Could very well be the case here. Either way, I can name a few other models that retain more clarity and also offer more quantity for roughly the same price. Not fond of this, but then again we are comparing with two of the best iems in this pricing tier. Compared to those models, this Rain3 falls. Compared to what others consider “good” in the $100usd iem tier, both of these models are just fine and solid alternatives to the majority of those iems out there. Both models share the same experience in height and width, which is actually very nice for an iem, especially so in the budget category. I’ve not come across many iems lately that feel properly setup and spacious without sacrificing that sound bubble that feels shapely. 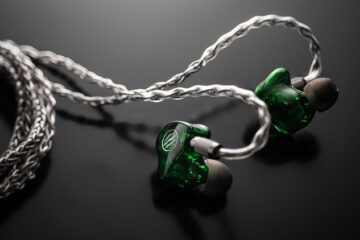 Most iems get that physical shape setup incorrect, which ends up unnatural. Only a few get it right. For this price, both models shoot on the upper end of the x/10 scale for staging elements. No, they are not the best, but they are certainly not lacking. The Rain3 feels like it is the more spacious in depth of field, but that is an illusion of the ear, at least in my opinion. The reason I say that is because the height and width feel naturally setup and well formed, but that slightly recessive midrange really makes things feel more spaced out in terms of stage-forwardness. Is that a big deal? Nah, lots of listeners love this type of sound presentation. Well, sometimes it is hit and miss. I think the Rain3 is a miss and the MS02 is a hit. I felt like more could have been done and despite my love for woodie headphones, I can’t help but wonder what other improved drivers could have been used here if it were not for the costs of the wooden housings. In this price tier, quality is what matters, not with the exterior casing. 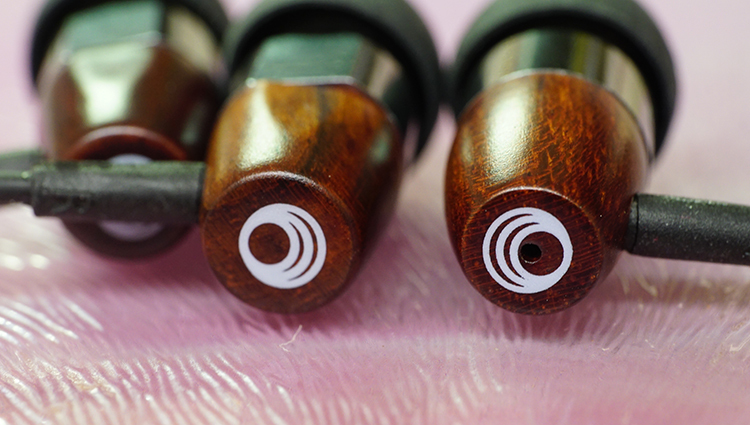 Woodies are indeed fantastic and beautiful, no doubt these iems are lovely looking and will turn heads. But in this tier, plastic is fine and the cost differentials would equate to a higher likelihood of a really fantastic driver being used. Or, at the very least, a better one. I am not at all fond of these iems, subjectively. But objectively, I feel they are solid performers at this price when you look at the big picture and ignore the top 2 or 3 best sub $100 or so models out there. These would be excellent beaters, fantastic gym or running usage products and not something I would advise others to use as a primary option on the go. Subjectively, I am not happy with the treble experience on both models. I feel the MS02 houses an overly linear sound in the midrange up to the treble, where I’d prefer more of both. With that, there would be more balance potential to negate the elevated low end this model has. As for the Rain3, the recessive midrange and slightly wonky treble kind of threw me for a loop. Would I recommend the MS02? Absolutely. It feels musical to me and I think for that price tag, it would appease those just getting into the hobby of Hifi. It is more fun than the Rain3, that is for certain. The Rain3 needs some work, though, at least in my humble opinion. Nice review! Do you think MS02 is in the same league as Shozy Zero or Meze 11/12?